You are here: Home » News » Overseen by Bernardo Atxaga, issue no. 12 of the magazine Erlea has been published. Overseen by Bernardo Atxaga, issue no. 12 of the magazine Erlea has been published. The final issue of the magazine Erlea, whose first issue was published in 2009, has just come out. This 12th issue, along with all previous issues, was overseen by Bernardo Atxaga and is dedicated to the 100th anniversary of the Royal Academy of the Basque Language. The 12th and final issue of literary magazine Erlea was recently presented in Bilbao at the Euskaltzaindia—the Royal Academy of the Basque Language. 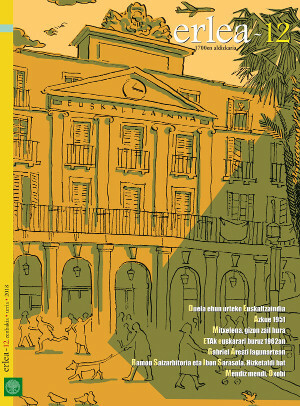 Edited by the Euskaltzaindia itself under the direction of writer Bernardo Atxaga, the magazine's editorial team characterizes "Erlea (as) an anthology of Basque literature from the beginning of the 21st century". The last issue, which closes the cycle that started in 2009, is focused on the 100 year anniversary of the Euskaltzaindia (1919-2019). In addition to the usual columns, 32 writers review the most significant events in the 100 years of the Royal Academy of the Basque Language's history. The back page of Erlea's final issue shows the covers of all 12 issues and a photograph of the editorial team in the office of the magazine's publisher, Pamiela. From left to right: Txema Aranaz, Asun Garikano and Bernardo Atxaga.